One of my favourite north Indian dish is chhole bhature. Chole is basically Kabuli Chana (chickpea) curry with a spicy, thick and dark gravy and bhature is an elongated puri made from wheat flour. I go back to my childhood days when I think about this dish. This dish is usually sold by the street vendors and hawkers. I used to have this with my friends when we were coming back from school or tuitions. It used to be so yummy and melt in the mouth. It is very difficult to get that same variety or quality anywhere these days. The chana masala used to be a mixture of spices that hit the taste buds and create a magic. And to top it, there was achaar ( pickle) to go with it. That vendor also used to give some finely chopped onions to spread on the masala and the tanginess along with the spice is still resting on my memory that my mouth has started watering. 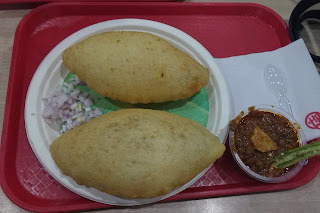 These days the best chhole bhature can be had in any of the Haldiram outlets. It is not as melt in the mouth as I spoke about, but the chhole masala is very tasty.